60% BIGGER FULL SIZE COMPASS - Accurate readable compass that performs every time. Adjustable dial to set heading and get you to your destination quick and safe in all emergency situations. 5 IN 1 TACTICAL GEAR FOR MEN - Powerful LED Multi Mode Light includes SOS and Locator to pinpoint rescue. Reliable Firestarter provides warmth while Military Grade 550 Paracord extends to 12ft. EMERGENCY WHISTLE & KNIFE - Alert rescue to your location or scare off approaching animals with proven decibel levels over 100! Sharp compact cutting tool can be used in multiple outdoor situations. 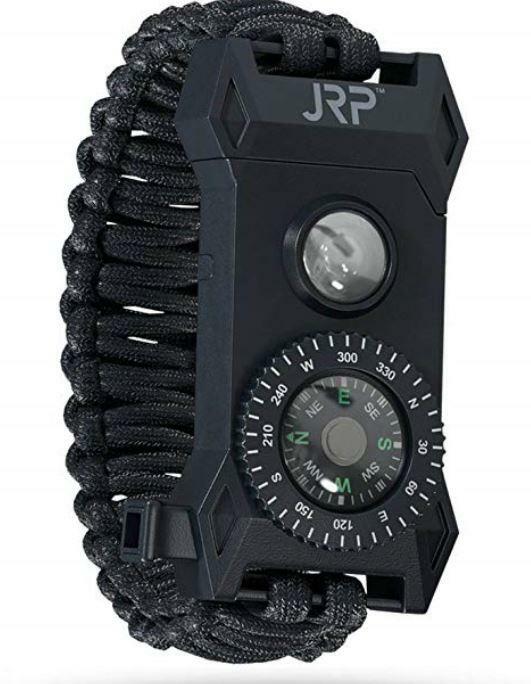 ULTIMATE TACTICAL SURVIVAL BRACELET - This survival gear gives you the confidence you need to brave the outdoors. Tactical bracelet that gets the job done every time, in every situation. AWESOME GIFTS FOR MEN - Perfect for Boy Scouts, Outdoor Adventures, Hikers, Hunters, Fishing, and Campers. Makes a wonderful gift and is hand made to ensure quality! Make no mistake with this real compass. Set your heading and know your destination with ease with an Over 1” Compass Display! 60% Larger than all Paracords on the market! VERSATILITY IN THE OUTDOORS - Camping, Hiking, Hunting, Tracking, Geocaching, or Kayaking! Magnesium Flint fire starter for reliable performance every time! To measure, simply wrap a piece of string around your wrist, put a finger in between the string and your wrist, and measure the length. The bracelet should be snug with just a bit of play. Large size fits wrists between 8 1/2 inches and 9 inches. Buff Dudes and Dudetts! Note: If your wrist measures exactly 8 1/2 inches or a bit less, it may be better to go with a Medium for a more snug fit. Medium size fits wrists between 7 1/2 inches and 8 inches. Most adults fit into this category. Small size fits wrists between 6 1/2 inches and 7 inches. This size is typically for small adults and children 10-14.